On google earth, you can see images of every land mass on the planet. You can compare these images to reality, by looking at places you have been too or photographed. You can also measure distances. Now if the Earth is flat, then to fit the continents to the globe, they would have to distort the images, ones at the edges of continents would be compressed radially from the centre. Try pressing a bit of paper onto the surface of a ball to see how it would distort. So the Google Flat Earth Challenge is to find an example of such a distortion. Explain the distortion and the actual appearance, post a pic of the location from ground level if you can. Distance discrepancies must be compared to an accurate map. No low rez zoomed out distortions, of course it's not accurate, it's low rez. and yes we all see the arctic region looks funny in low rez. No colour differences, its a different day dumbass, you need shape discrepancies. No Antarctic centre stuff. Its low rez coz no-one cares, and you've never been there anyway. Re: Google Flat Earth Challenge! Speaking of google earth, they use 2D textures. Yes, it is clearly 2d. Pls only post your entries. I zoomed into the middle of the pacific ocean on google maps and google earth and surprisingly no renders of the ocean's surface were available to see. The sea surface is not land retard. So RE is a jigsaw puzzle of FE land mass pieces, and you're okay with that? I'm asking you to prove that it is. If the pieces are from a flat earth, then they can't fit on a globe, they have to be distorted. Show me one of these distortions. Please post an entry next time. North pole is ocean, southpole is low rez. Oceans != land. learn to read. Post a co-ordinate next time or you fail for life. You may choose to disclude the oceans from your earth, but FE includes the oceans in theirs. Oceans don't exist on the surface of your earth? 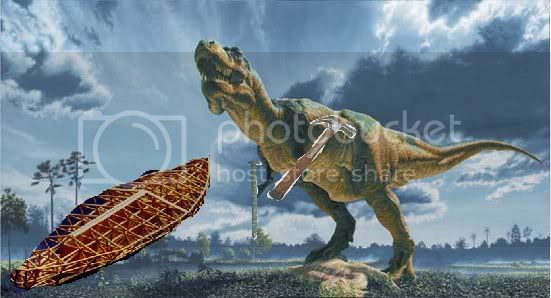 The dinosaurs would've likely used different construction methods than our own, but your depiction is fairly accurate. I disagree that's anywhere near accurate. Postulating steel tool construction would be an entirely new and unexamined theory. Personally, I think it should be dismissed as sheer speculation. Funniest thing I have seen all night. Why justify an illegitimate attack with a legitimate response? Sorry, not funny. Dinosaurs building boats is a tough act to follow. What isn’t funny about that? Hey kid, dont you have paladin to level up or something? This is a thinly veiled ruse. Since Tom, narcberry and most other FE'rs know that anything resembling navigation is a guaranteed doom for them, they they will try to derail any test even remotely based on navigation. Any experiment that requires only hundreds of miles of travel on land and maybe the use of a moderately priced telescope will scare them senseless, because they cannot say it is beyond their budgets.